Drinking a cup of carob tea after a meal can help to slow the release of sugars into the blood stream, and helps to fend off cravings for sugar-laden desserts. Additions: Use just a bit of raw organic honey to bring out the warm tones of the chocolate-like flavor. 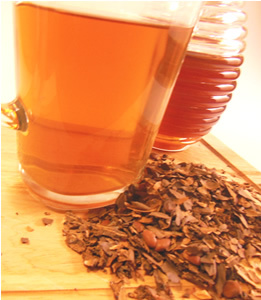 Variations:Carob tea blends well with spices, mints and orange, and makes a soothing, tasty tea on its own. Recipe Instructions: Decoction :Bring to a slow boil in covered pan. Turn off heat and let steep for 5 minutes. Serve hot.